While cats usually ride in cars on an “as needed” basis, dogs are common car passengers and travel companions. But is riding in the car safe for your pet? Wearing a seatbelt is the law in all 50 states and most people wouldn’t dream of driving without buckling themselves – and their children – up. And yet how often do you see dogs riding in a car unsecured, often with their head out the window or worse, sitting in a driver’s lap? In a car crash, there is little difference between an unsecured dog and an unbelted human – both become large projectiles, extremely vulnerable to serious injury or death, or injuring others. 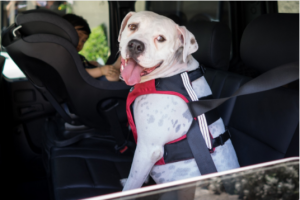 According to Bark Buckle UP, if an accident occurs while the car is moving at 35 mph, an unrestrained, 60-pound dog can turn into a 2,700-pound projectile. Just like children, pets should never be allowed to ride in the front seat. Besides the obvious potential for driver distraction (according to the American Automobile Association, loose pets ranked third on the list of top driver distractions), hard dash surfaces and airbags, which deploy at a force of 200 miles per hour, can cause severe injury and even death to pets. When you were growing up, how many times did your parents tell you not to sick your arms or head out the window of a moving vehicle? This is not safe for dogs either. At the very least, they can get dust and debris in their eyes, causing injury. If your dog enjoys the breeze, a safe alternative is to open the window a few inches. According to the Center for Pet Safety, there are no safety standards or required testing for pet products. The Consumer Products Safety Commission does not consider pet products “consumer products” and therefore does not scrutinize the accuracy of pet product manufacturers’ claims. The Center, in conjunction with Subaru, has conducted 29 crash tests with various restraints. Astoundingly, 25 restraints failed. Among all the pet harnesses tested, only one harness passed the crash test. The all the other pet safety harnesses failed to keep the dog from launching off the seat in a crash! The one safety harness that the Center for Pet Safety recommends is Clickit Utility dog harness by Sleepypod. The harness also includes a d-ring on the back of the vest so it can be used as a walking harness. For small dogs and cats, two soft-sided kennels, properly secured, passed the crash test. The Mobile Pet Bed with PPRS Handilock, again, by Sleepypod, has passed numerous crash tests. 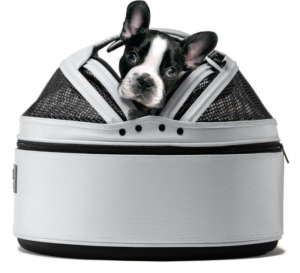 (Sleepypod crash tests its entire line of dog safety harnesses and pet carriers at the standard set for child safety restraints.) The other recommended carrier is the PetEgo Jet Set Forma Frame Carrier with ISOFIX-Latch Connection. If you have an SUV or station wagon (yes, they’re making a comeback), a pet crate secured in the back of the vehicle may be the best way for large dogs to travel in comfort and safety. The one hard-sided kennel to pass the Center for Pet Safety and Subaru’s crash tests is the Gunner Kennel G1 Intermediate with Strength-Rated Anchor Straps. While most of these products carry a somewhat heavy price tag, the peace of mind of knowing your pet is as safe as he or she can be in a crash – or as compared to the vet bills associated with injuries – they may be well worth the investment. Please note that The Animal Foundation does not endorse or use any of the products mentioned in this blog post.